A cotton twill weave homespun blanket made in two panels joined with a center seam is patterned with a large scale check in indigo wool. Within each square is a multicolor circular motif hand sewn in red| green| and indigo wool yarn. 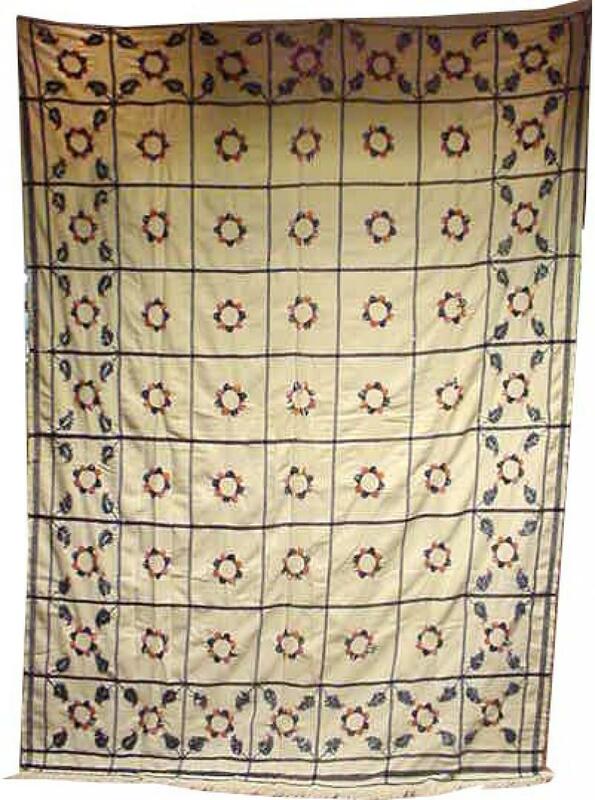 Probably of New England origin| this hard-to-find| collectible early 1800s hand woven blanket is filled with detail. There are larger flower-like lobed circles within the squares| and leaves emerge diagonally from smaller flowers that make a framework for the composition. The overall effect is classic early Americana with a textural dimension and freshness that belies its nearly two centuries of age. Condition: The colors of the embroidery remain vivid and probably 85% of it remains intact. There has been loss of long stitches in some areas but no motif is too diminished because all flowers look intact. There is an old mend where there was an L-shaped tear coming in from one edge. The blanket has been washed causing an almost imperceptible shrinkage to the indigo wool.